Can You Stare Like a Whale? Don’t asked me why I decided to name him Placebo Duck. For once, there was no logic behind my madness. Anyway, my mum, she absolutely loved her duck. I even gave her a list of his super powers and weakness, just in case she needed to know someday. Super Placebo Duck’s super powers include: Flight (has not figured out landing yet, though); Bread Vision (can turn anything into bread with his crusty gaze! ); Super Duck Strength (7 times the strength of a normal cape-less duck); and Witty Comebacks (self-explanatory.) His only weakness: Pears. With ducks on the brain (and just a touch of crazy) I thought it might be nice if I offered up a new free pattern. So I set out to make a little crochet cutie I could share with you all. And thus we have, Filbert! Filbert, Super Placebo Duck’s younger cousin, doesn’t have any ducky super powers, unless you count the power of his cuteness. This little duckling is pretty tiny. Finished size is just a few inches tall (so he crochets up super quick!). Given its size, it is not suggested that this toy be given to any very little ones. Chain 6, plus 1 for turning (chain 7 total). 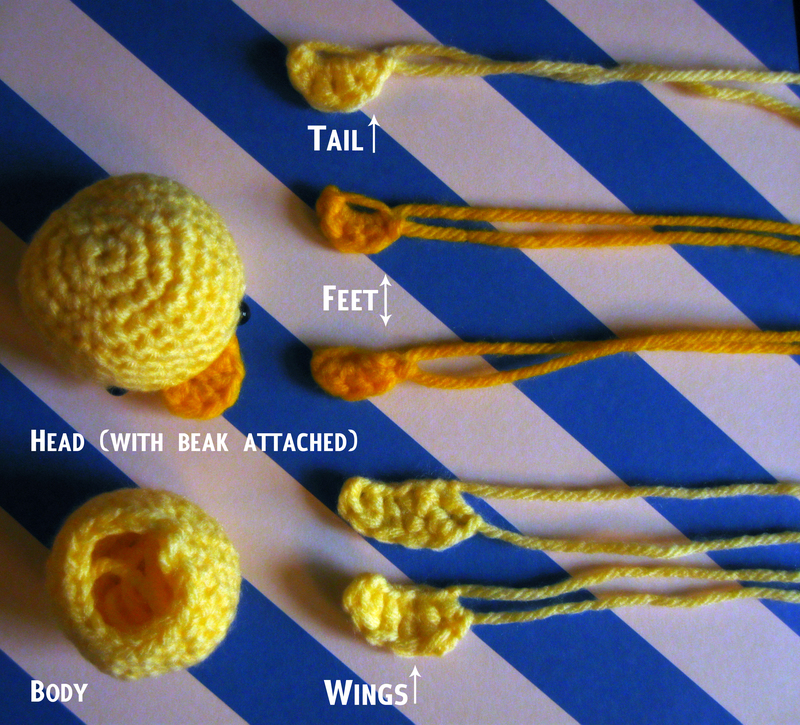 Make a single crochet in the second chain from hook. Next work two hdc, one after another. After that work one dc, one trc, and finally a hdc in the last stitch. FO. You should now have a sort of triangular piece of fabric. The thicker end (with the yarn tails hanging off it) will be sewn to the body. (Therefore, the smaller end opposite that is the bottom of the wing.) For a visual of this kind of technique check out my Confused Owl pattern. The beak is super simple. What we need to do is create a magic circle. Instead of working single crochets in our circle, though, we’re going to make half-double crochets. So to start make your magic circle. Slip stitch once. Then work 5 hdcs. Slip stitch once more, then fasten off. Don’t completely pull the yarn tail (thus closing the circle.) Just pull the yarn tail enough to make the beak look like a semi-circle. There’s your beak! You can sew it right to the head, weaving in the ends. You can attach your eyes after sewing the beak. The feet are made just the same as the beak, only instead of 5 hdcs, just work 3. Sew ’em to the body and weave in ends. The tail, as you might’ve maybe guessed, is worked just like the beak and feet. The difference this time is this: instead of working 5 hdsc, work 5 dcs. That’s it! Fasten off, sew it on your duck’s booty and weave in ends. Go ahead and sew everything where it needs to be, stuff the head and the body, and then sew those two together. Weave in ends and there’s you oh so adorable mini duck. Please note: This is an original design and pattern. I do not grant permission to anyone to sell any products made as the result of this pattern and/or design. Please, if you do use this pattern or design direct others to this original posting so that they too can enjoy the super ducky cuteness. For a full list of amigurumi-related posts visit the amigurumi page. Have fun! OMG soooooo adorable!! MUST MAKE A WHOLE ARMY OF THEM!! Do you have any patterns for like a bunny or a dog or stuff like that? Thanks! Do you happen to have the pattern for the tie? I’m terrible at figuring that stuff out on my own. Lol. My step daughter wants the tie made. haha. Holy adorables! Thank you so much for sharing – I’ve been looking for a pattern for my first Little Yellow Duck Project duckling, and I think I found it! And by the way, OMG, those glasses on Super Placebo Duck’s mild mannered alter ego? SUPER CUTE! I'm an all around artistically inclined, creative kind of girl. Along with creative pursuits I like learning and solving problems and getting right to the bottom line. I'm a genuine science fiction fan, my cats are more important to me than anything - period - and I do my best to just be me. And somehow I manage to balance my no-nonsense attitude with my limitless creativity and childlike love for cartoons and fuzzy animals for an all around okay life. Unless otherwise stated, all content of this blog including, but not limited to, images and text has been created for personal, nonprofit use only. You are not authorized to print, reproduce, copy, redistribute, alter, customize, trace, or in any way modify any images or text without direct permission from this artist. The contents of this blog are the property of Karissa Cole/ex-astris1701 2013, all rights reserved. Disregarding my artistic right will result in my army of fire breathing llamas hunting you down and destroying you where you sit. And if that doesn’t work, we’ll sic the lawyers on you. You have been warned. For permission to use a work or to inquire about commissions, please contact me using the form provided on the "Contact" page. Can You Stare Like a Whale? Read the story to find out! After that use the free accompanying pattern to make your own micro whales. “Worrying is a misuse of imagination.” Try thinking about how awesome it would be to have a pet dragon instead. Now you can make your very own adorable squid! This pattern comes in PDF format with plenty of pictures and step-by-step instructions to guide you. All rights reserved. May not be copied. © Karissa Cole 2013. Love, imagine, create, scrap, live.